If you’ve followed my writings or practices for very long, you know that I do not believe in the industry wide duplicitous practice of using extra-long barreled laboratory test barrels to establish our advertised velocities. These types of industry practices generate false high velocities that a person would never get for an actual firearm made for field use. Instead, we use real firearms. 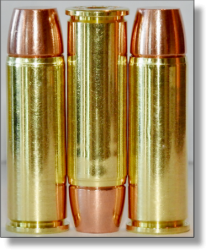 Below see the velocities we obtained with our firearms with this new DG 454 Casull load. The 6-inch FA revolvers are mine and the other 454’s used in this testing belong to friends. 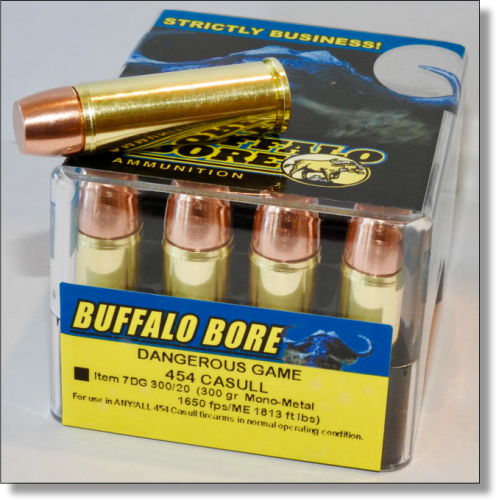 This 454 Dangerous Game load is a serious big critter stopper that can be housed in a “packing” sized revolver. The proficient use of this type of very powerful cartridge fired from handguns will require much practice to be used with proficiency, but what a great load this new DG 454 Casull is.